Former Yugoslav leader Slobodan Milosevic has begun cross-examining Kosovo President Ibrahim Rugova in an exchange described as feisty and antagonistic. Mr Milosevic rejected the assertion of Mr Rugova, the most prominent Albanian to give evidence at the war crimes tribunal in The Hague, that he had triggered the 1998-99 war in the breakaway province. The judge intervened and told both men to stick to the indictment when Mr Rugova told the accused that Kosovo belonged to the Kosovars and that Belgrade should give up the province at once. Earlier, Mr Rugova, wearing his trademark silk scarf, answered the prosecutor's questions without looking at Mr Milosevic, who in turn looked at the ceiling and occasionally yawned. The accused began his cross-examination by labelling the witness a pawn of the "great powers" who had tried to implement their own agenda. Addressing Mr Milosevic directly for the first time, Dr Rugova shot back: "The great powers and the international community came out in our defence, for human rights and against the massacres perpetuated by Belgrade and by you." Mr Milosevic asked several times if the witness believed the Kosovo Liberation Army (KLA) - the armed guerrilla that began opposing the Serbian police in the late 1990s - was a terrorist organisation. "That's newspaper stuff," Mr Rugova said dismissing the question. "The KLA was an organisation that responded to repression and violence for the purpose of winning freedom for the people." Mr Rugova was leader of a parallel Albanian administration in Kosovo after Mr Milosevic imposed direct rule on the province in 1989. Mr Rugova was expected to shed light on the Serbian leadership's behind-the-scenes manoeuvring during the Kosovo conflict, unlike most prosecution witnesses who have focused on specific atrocities in the Balkans wars. "Belgrade clearly decided to destroy Kosovo through violence and war," he told the court. He said Albanian-language media in Kosovo were shut down under Serb rule, with journalists being physically thrown out of their offices by police. He also testified that by 1993, 150,000 Kosovo Albanians had been fired from their jobs "because of their ethnicity". "The Albanians were pushed out of the economy and from public services," he told the court. Mr Rugova became president in March after Kosovo's first elections since Serbia lost de facto control of the province in 1999. Before that time, Mr Rugova had tried to win concessions from Belgrade, but with little result. 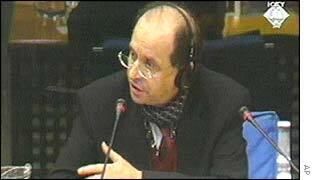 During the Nato bombardment in 1999 Mr Rugova appeared on television with Mr Milosevic, a move that cost him much of his credibility. Nonetheless he rebuilt his reputation after the war, and his party polled the most votes in the November 2001 elections, held under the auspices of the United Nations protectorate in Kosovo. Later, former Yugoslav Deputy Prime Minister Nikola Sainovic appeared before the tribunal, pleading "not guilty" to five charges of war crimes and crimes against humanity. Mr Sainovic, who gave himself up on Thursday, is indicted on the same war crimes charge sheet as Mr Milosevic, in connection with events in Kosovo. "There was a tangible cold distance between these two political adversaries"
"Rugova's... actions... still need a lot of explaining"